An underground coal mine is an unforgiving work environment for surveyors, whether they’re mapping the next seam of coal or determining where to drill a tunnel to rescue trapped miners. Marshall Robinson, PS, started as an English major at a Tennessee college, but a pull from his native West Virginia brought him back home to the coal mines. 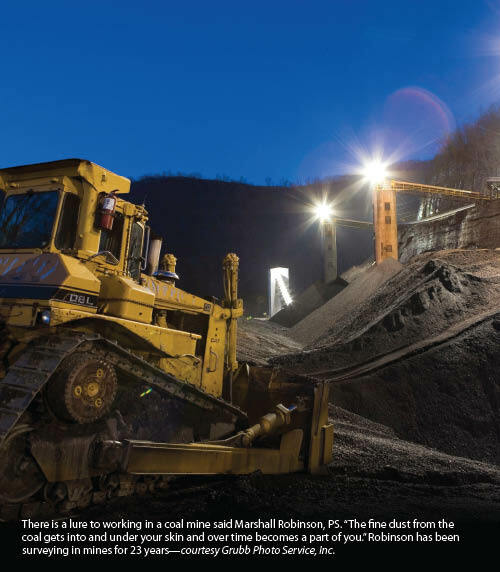 Robinson is the owner of Allegheny Surveys in Birch River, West Virginia, and has been in the business for 23 years, with about a quarter of his firm’s work in coal mining. After a surveyor has determined the mouth of a mine, Robinson says, “We continue from that point on to guide them, give their equipment direction … It’s not rocket science, but there’s a real knack to doing it. There’s a wall of black, and the miners don’t know where they’re going unless we give them two points on the roof.” A hand chisel and hammer are used to install a “spad” into the roof as a survey station so a plumb bob can hang from it. “If you put it in the floor you would never find it because of the mud,” he said. About 50% of underground coal is removed by continuous mining machines equipped with tungsten carbide-tipped bits on a revolving cylinder, according to Coaleducation.org. The machine breaks the coal from the face and then sends it to a shuttle car that transports it to a conveyor belt, moving coal to the surface. After going forward a specified distance, the machine is backed out and roof bolts put in place. The process continues until the seam is mined. Another method—longwall mining—accounts for about 49% of production. 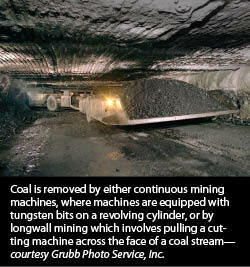 This method involves pulling a cutting machine called a shearer across a 4,000- to 6,000-foot-long face of the coal seam. The machine has a revolving cylinder with tungsten bits to shear off the coal, which falls into a steel conveyor system carrying it out of the mine. The immediate roof is held up by large steel supports attached to the longwall system. As the shearer moves forward, the roof supports advance, with the roof behind the supports falling. A small percent of underground production involves using explosives to break up the coal for removal, but explosives play the key role in surface mining. Robinson said that, typically, a mine uses surveyors two or three times a week as the operation progresses. In addition to paying attention to what’s above the miners, “we are guiding them around gas wells and old workings [former mines],” Robinson said, making sure there are the required buffers between them and what could be a potential hazard, whether it’s an old mine filled with “black damp,” air that is lethal and immediate (“you don’t sit and choke for a few minutes, you die”), or abandoned mines containing water. This was the situation in July 2002 with the Quecreek accident in western Pennsylvania. Robinson explained that someone had failed to file a map with authorities, and the next surveyor was unaware of an adjacent old mine until it was cut into, releasing 50 million gallons of water into the mine and cutting off nine miners from escaping to the surface. For more than three days, the miners were trapped 240 feet underground in a chamber just over four feet high and 18 feet wide, in 55-degree water, until they emerged, exhausted, soggy, and blackened with coal dust, according to news accounts at the time. Underground, “it’s an extremely unforgiving environment,” said Robinson. In addition to life and death matters, there are also financial considerations. “If you make a mistake underground, you hear about it the next day,” R. Larry Grayson, professor of energy and mining engineering at Penn State University, added that something like $75,000 of lost production revenues per day for a small mine to more than $1 million a day for a large metallurgical coal-mine is a big deal. He described the darkness inside a mine as “palpable, weighty,” and it mixes with the sounds of “the clattering conveyor belt spilling coal over the rollers and the whine of the roof bolter pushing pins into the roof.” There is a constant smell of coal and dust and grease and dampness. “When I started I mostly did surveying of low seams, which are about 34 to 38 inches high between the roof and the floor,” Robinson said. “It’s like surveying under your dining room table.” Surveyors have to use scaled-down tools—for instance, cutting down the legs of their tripods. “There’s a lot of crawling on your hands and knees, but as a kid I was the best at hide-and-seek, finding all the hidey-holes, so I took to this naturally.” He added that, “it does take a special mindset to do this work. Party chief and rod man turnover is high” even though they are paid higher for working underground. Once survey points are installed in the ceiling, reflective tape is hung and a line is painted to connect the points. “This is what the miner follows with his equipment,” Robinson said. Mine engineers design the ventilation systems that provide air not only for the crews, but also to control coal dust and methane underground. The system manages airflow so the gas dissipates or is swept away. Most of the recent government legislation dealing with mining focuses on miner health and safety, said Grayson. Prior to joining PSU, Grayson was associate director of the Office for Mine Safety and Health at the National Institute for Occupational Safety and Health (NIOSH) and spent nine years in the coalmines of southwest Pennsylvania. Robinson said the first order in a rescue is to mobilize a drill rig to where you think the miners might be; next is to locate the monuments (rebar in concrete) that are required at the mouth of a mine. This control “is what a mine survey comes off of,” Robinson said. “You then set up your static GPS receivers and start collecting data.” At Sago, “we tried to use radios for RTK, but we were too far away, it was the middle of the night, and we were unfamiliar with the area. “We broke out more receivers … got plenty of data. We recovered our receivers and downloaded everything to the laptop, processed it, and adjusted the derived coordinates. A crew using conventional equipment staked out the chosen coordintes of where we thought the miners were most likely to be,” he recalled. The 13 miners were trapped for two days, and the recue attempt failed except for the lone miner who survived. Added to the tragedy was an erroneous report that all had been rescued, providing joy to loved ones on the surface that was later cruelly snatched away. Robinson said Sago happened in the days before West Virginia’s Virtual Reference System (VRS), a network of GPS information that allows you to work live and not have to re-do work, making it “faster to get a stake in the ground,” he said, adding that a mirror image above ground of what’s happening below ground is needed. “It has to be apples to apples,” he said, and VRS is helpful only if the underground workings are mapped and kept current. (See the feature story “A Rural Real-Time Network” in the June 2011 issue about VRS in West Virginia). Penn State’s Grayson said that in looking at new safeguards, “when disaster strikes, miners [and survey crews] need a better place to go.” Under new legislation, more technology has been brought into play, including better communication. 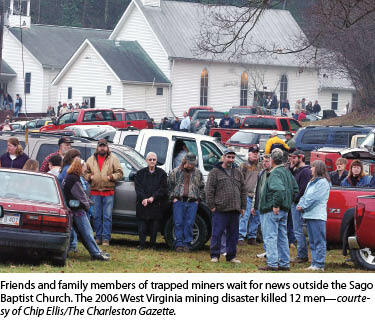 Many, including Robinson who worked with West Virginia on a forensic study following the disaster, have said the Sago miners were just a short distance from the entrance and could have simply walked out. “But there was no good, direct communication to them,” Grayson said. Now, more robust communications and tracking systems are required in underground coalmines. A recent requirement is two parallel escape routes, equipped with “lifelines” (steel-covered ropes), because “it’s difficult to see in dense smoke and you are often feeling your way,” Grayson said. “To make sure they don’t go the wrong way, there are cones on the rope that point in the right direction for escape.” Additionally, there must be doors every 300 feet that open into another escape tunnel. Although those underground have an hour’s supply of oxygen on them or on the nearby equipment, “nothing is foolproof,” Grayson said. “So, a second set is provided in case the first personal device doesn’t work.” There must also be a required cache of stored breathing devices equal to the expected maximum number of people on a section or other area of the mine. And, NIOSH is working with a manufacturer on air cartridges that don’t require removing the mouthpiece when replenishing air. Grayson said coal companies are now required to have an emergency response plan and a designated responsible person in charge if disaster hits. In the case of the 2001 Alabama tragedy, the roof caved in on a battery-charging station, and a spark touched off a methane explosion. No one was killed or injured at that point, but the air system into the mine was compromised, and then a second, deadly explosion occurred 45 minutes later. Basically, Grayson said, no one took charge after the first explosion to say people needed to get out. “These are rare events—it happens—but obviously we don’t want it to happen. From 1993 to 2000 there were zero fatalities from disasters, so it’s been done and we can do it,” he said. Next: The surveyor’s role with the land after the coal has been mined.